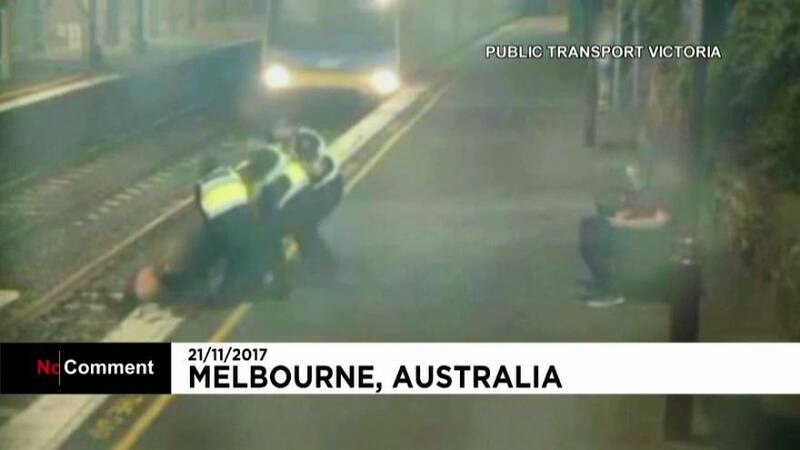 Dramatic CCTV footage has been released showing a woman narrowly avoiding being hit by a train in Melbourne. The woman tried to cross the tracks at an inner suburban station late at night, unaware a train was approaching. As the woman reaches out to someone nearby three police officers on duty at the station realise the woman is in trouble. They rush to help her – and manage to pull her up only seconds before a train comes rushing into the station. It’s not clear why the woman was on the tracks – local media suggest she may have been under the influence of alcohol. The train driver had hit the brakes, but there was no way of stopping it in time. Thankfully the woman managed to escape without injury.